In order to develop new and effective approaches to teaching, doesn’t it make sense to study how children learn? It may seem simple, but that question has been the foundation of Katie Gruskin’s interdisciplinary education at SUNY New Paltz. Gruskin ’17 ’19g (Early Childhood & Childhood Education) decided she wanted to be a teacher long before she came to New Paltz, while she was growing up in West Islip, Long Island. 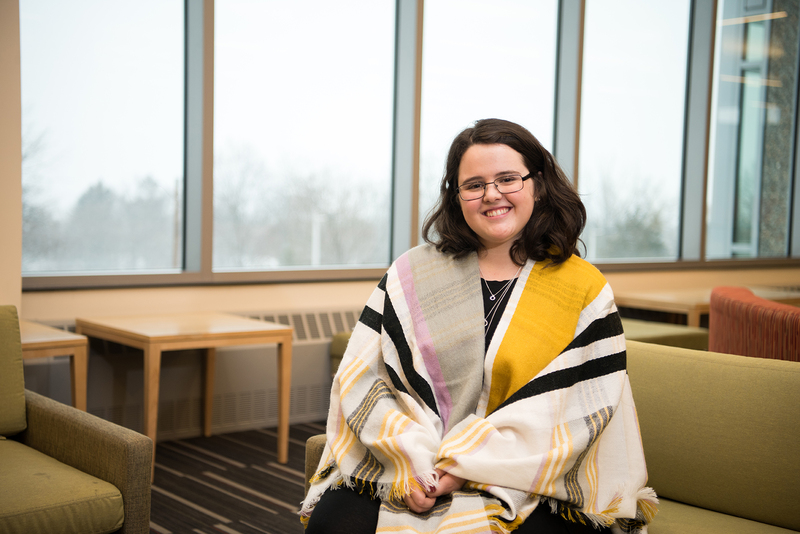 Her development as a teacher took a random turn shortly after she arrived in New Paltz, thanks to the Honors Program. Naturally, Gruskin’s first foray into evolutionary studies – which applies concepts of evolution as a lens to better understand a host of disciplines – focused on teaching and learning. She found herself fascinated by the idea that the modern classroom might better serve students by adding more hands-on and collaborative learning exercises. Gruskin continued to research these ideas throughout her undergraduate experience, working closely with Evolutionary Studies Program Founding Director Glenn Geher, conducting a survey of fellow New Paltz students, and presenting her findings at the Northeastern Evolutionary Psychology Symposium. Ultimately, Gruskin developed a thesis that earned publication in a major disciplinary journal: she was lead author (with co-author Geher) on “The Evolved Classroom: Using Evolutionary Theory to Inform Elementary Pedagogy,” which appeared in Evolutionary Behavioral Sciences in October 2017. While she has enjoyed significant early-career success as a researcher, Gruskin has continued to pursue her dream of becoming a teacher. Now a graduate student and substitute teacher, she is enjoying opportunities to test evolutionary ideas about teaching and learning in real-world classrooms. “The research helps me think about why I’m teaching the way I am, or different ways I can teach,” she said. “I’m a big fan of cooperative learning: the kids working together, having choices, working collaboratively, hands-on and self-directed. Visit the School of Education online to learn more about teacher preparation programs at SUNY New Paltz.